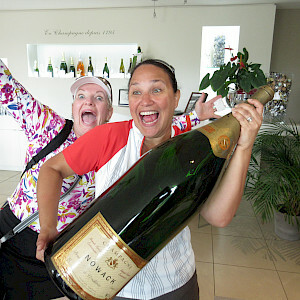 We all failed the champagne quiz, but we still got the prize – a cool, refreshing, glass of bubbly. 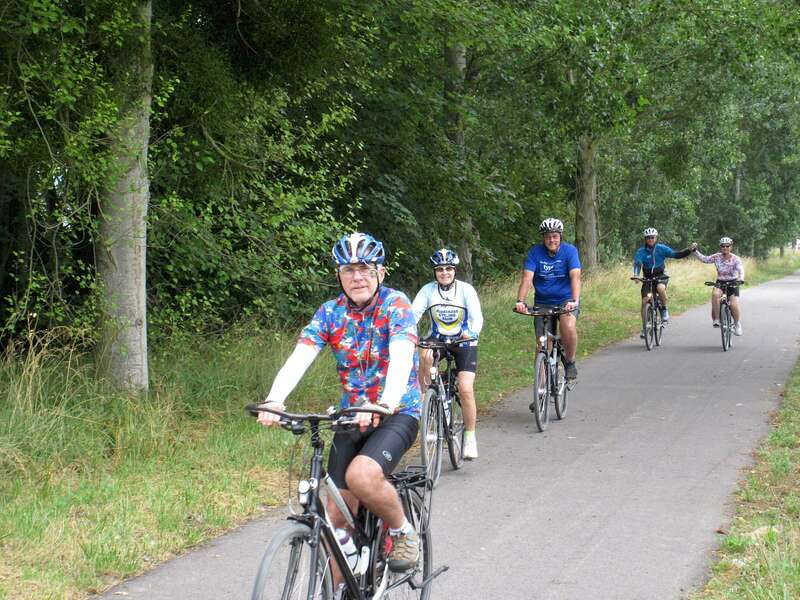 For cyclists riding along the French countryside on a warm, sunny day, what could be nicer? 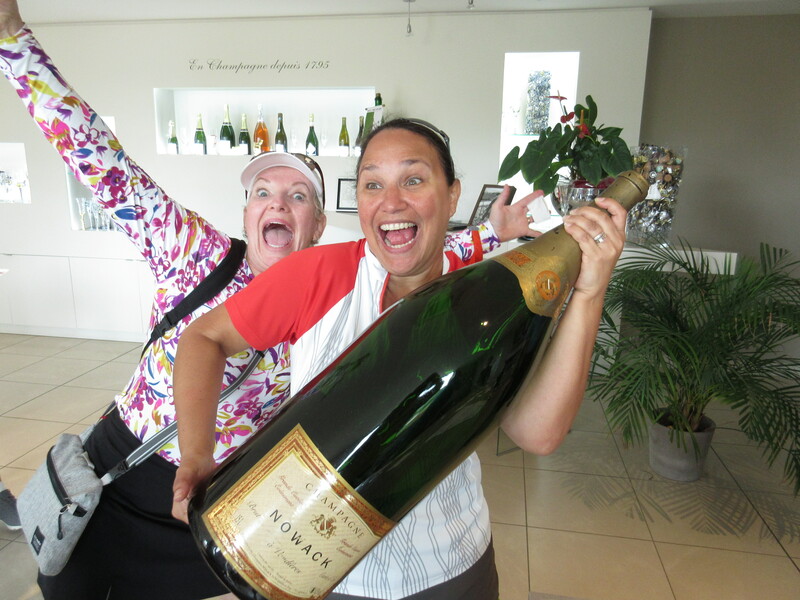 Le Tour de Champagne: Riding among some of the most famous vineyards in the world – with names like Moët & Chandon – filled us with energy … and a desire to get to the Champagne house over the next hill. 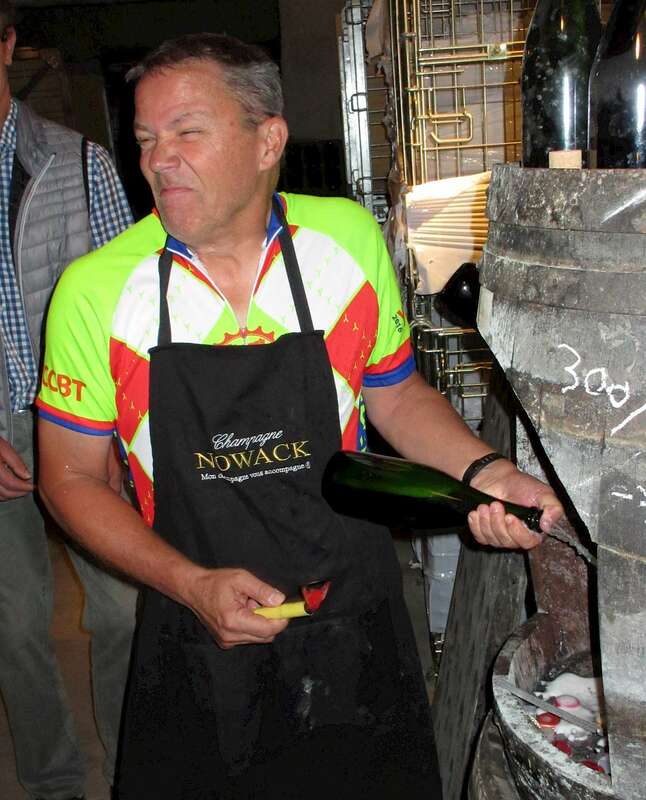 The question that Monsieur Nowack – the great-grandson of the founder of the champagne house – asked was fun: Why do the corks on champagne bottles have a little round piece of metal – called a muselet cap – between the cork and the wire cage that keeps it from blowing off the bottle? We were standing in a tunnel deep under the company’s headquarters, and enjoying the cool, dark, and wine-tinged mustiness, surrounded by hundreds of thousands of bottles of aging champagne. 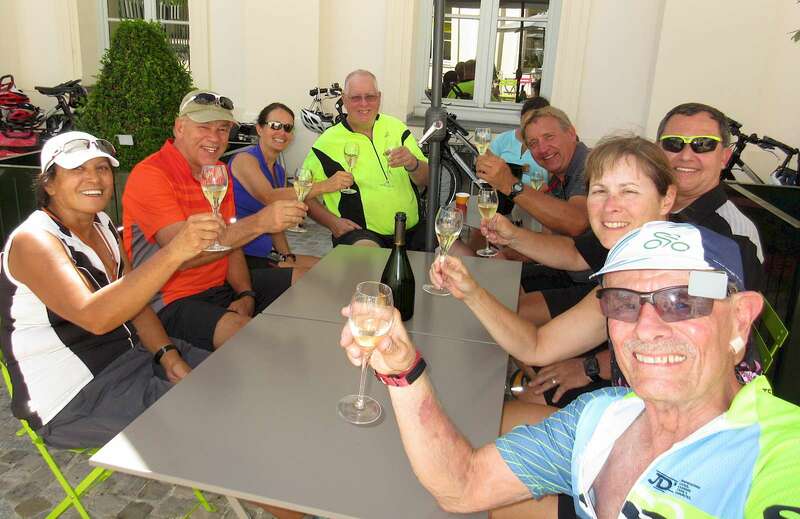 It was the perfect refuge after riding across brilliant acre after acre of world-famous blanc de blanc and pinot champagne grapes. The Zwaantje was our home for the tour. It's extraordinary Captain, Martijn, and his crew gave us great grub, clean rooms, solid bicycles – and always a helping hand. At dawn each morning, Martijn jumped on his bike and come back with a big basket of warm baguettes and other goodies for breakfast. 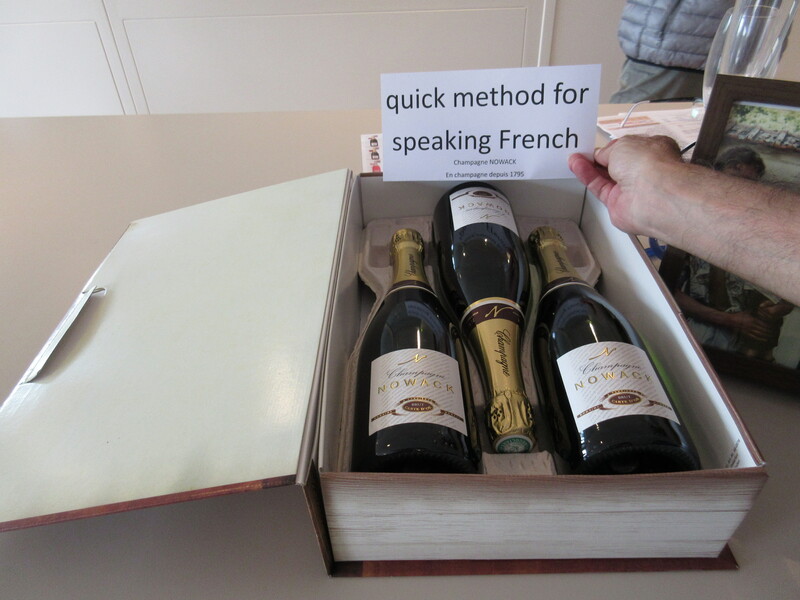 The sediment in a Champagne bottle settles into the neck. 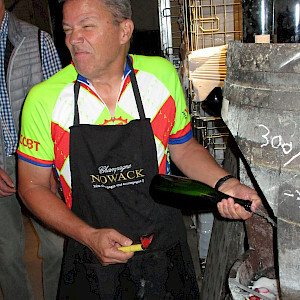 Fellow rider Paul demonstrates how to remove it without losing too much champagne. 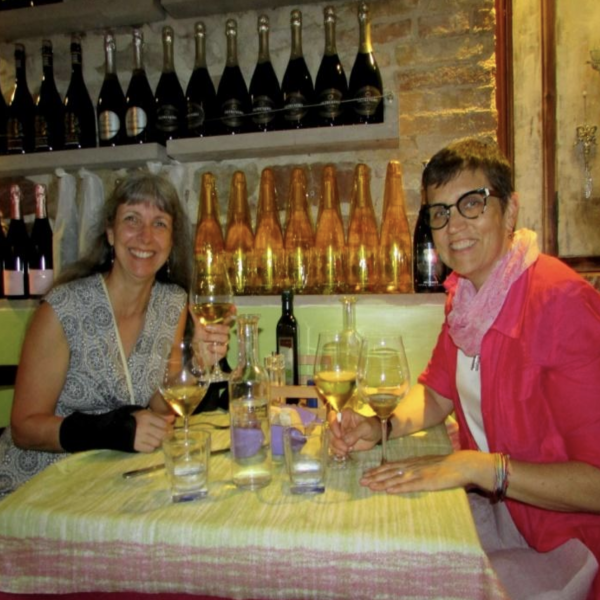 Did we have fun – or what!!! 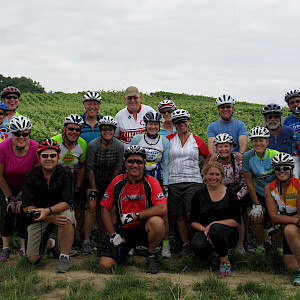 Even veterans of group rides like me can learn something new about safe riding. On this trip it was “cornering” – a brilliant way for making rides with many turns more fun and safer. The guide gave us good cue sheets each day, but while admiring awesome towns and equally awesome countryside, it’s easy to miss a turn. So as we approached turns, our guide would yell out, “Corner!!! !,” and one of us would reply “Got it! !” That person would direct others into the turn until our “sweep” – the rider at the back who made sure no one was ever left behind – gave the hi sign. Two of our riders once tried to scam the sweep, an old friend, by hiding behind bushes as he rode by, and even then the cornering system was what saved them from getting lost! 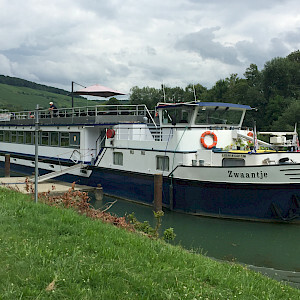 If you decide not to ride with the group on a given day, you still see stunning scenery from the boat – and get to catch up on your reading. An electric bike is NOT a copout and, since it gets reluctant riders out on two wheels, I’m a fan! My wife is a good local rider at home – we do many of our errands in Arlington, Virginia, on our bikes – but she’s the first to admit that a half- or full-day ride isn’t exactly her cup of tea. 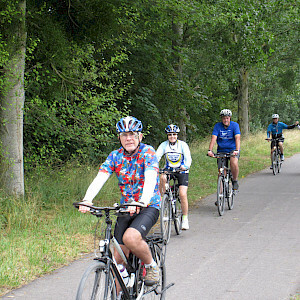 The electric-assist bike, which the tour company provided at a very reasonable price, allowed her to ride 30-40 miles a day – and enjoy every minute of it. The ease with which Marian climbed hills, including one we reliably clocked at a 14 percent grade, became a fun point for everyone in our group. She’d remind everyone at dinner, it was electric-assist – she had to pedal and got an appropriate amount of exercise too! It was true, but that didn’t protect her from getting a nickname or two. One was “The Queen,” for how she waved regally as she passed us on the hills. The other was “Zippy.” She loved it. 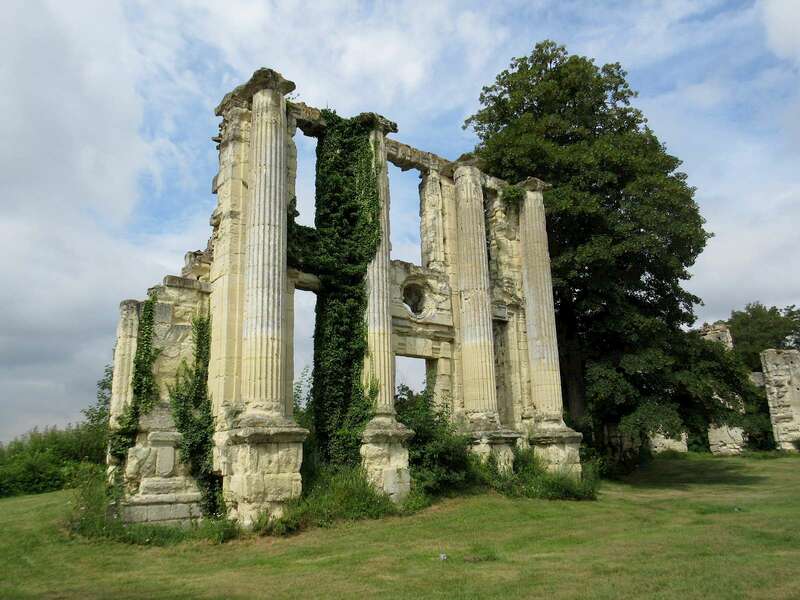 Even though the roof and most of the walls of a grandiose Palace at Montceaux-les-Meaux – home of Catherine de Médicis and others in the 16th-17th centuries – fell long ago, the remnants show the stunning beauty of the site. Another of the great joys of bike trips is that we see with our own eyes that many stereotypes about the countries we visit need updating. 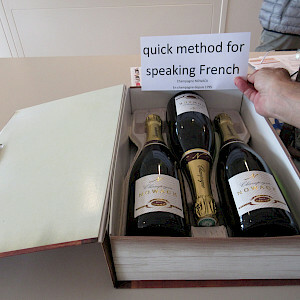 For various reasons, many Americans think French can be difficult (and many French think the same of us). But to be honest, it’s hard to find evidence for such a misunderstanding. 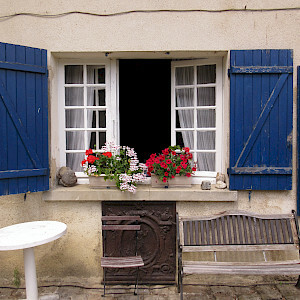 Wherever we went, we were greeted with a “Bonjour” sung out with gusto – and there was appreciation when we sang it back. 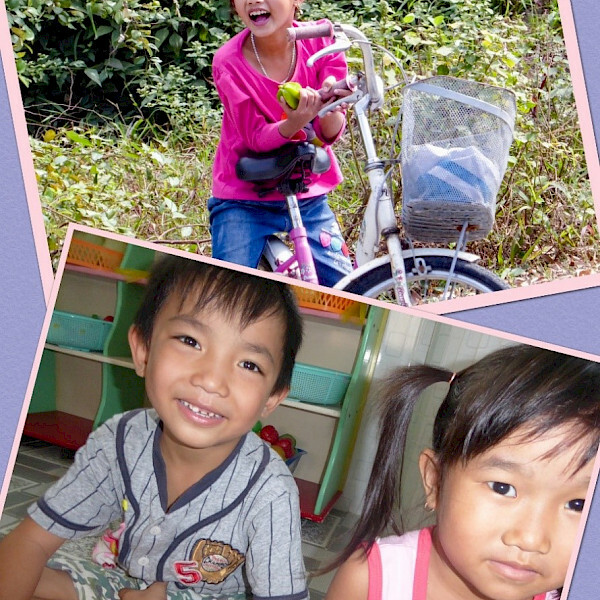 Children marveled at the sight of two dozen foreigners on bikes enjoying their villages. In a little village, schoolkids ran along high-fiving us – a genuine welcome. Wherever we went, we saw tangible signs of France’s appreciation for its historic ties with the United States. 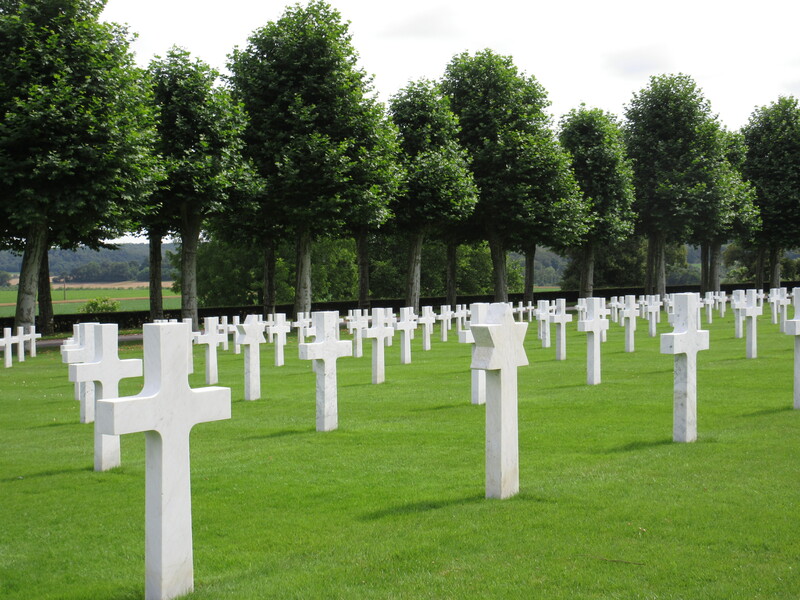 We rode through the heart of major battlefields of la Grande Guerre – World War I – and visited the Belleau Wood Marine monument and a majestic war monument near Chateau-Thierry. In the town of Chateau-Thierry, there’s an entire museum – in the “France-America Friendship House” – dedicated to memorializing U.S. help during WW I. 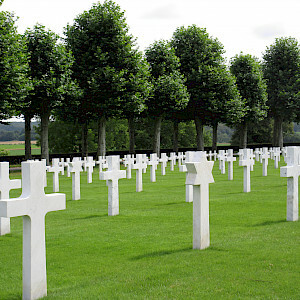 It had a full-room tribute to Quentin Roosevelt – the youngest son of President Teddy Roosevelt, who in 1918 died defending France as a pilot for the U.S. Army Air Corps. 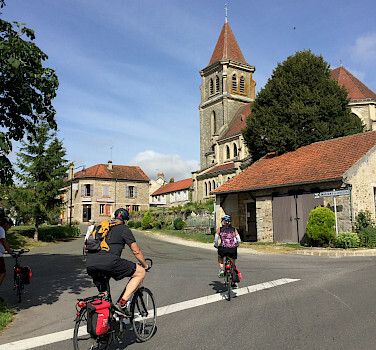 The cycling infrastructure in France may not be as famous as in some other countries we’ve ridden in, such as the Netherlands, but our guide found great paths on which we could ride safely, close to nature, and with beautiful scenery. 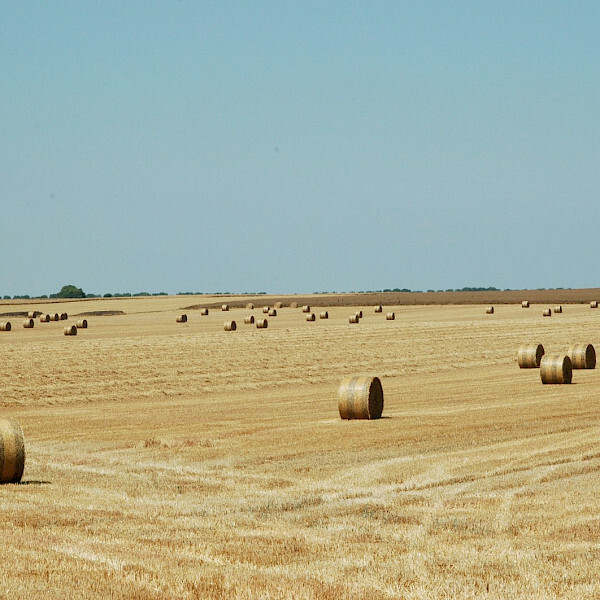 Sometimes we’re a little guilty of looking too hard for the “magic moment” – the photogenic experience we can tell folks back home characterized our wonderful communion with the country we’re visiting. On this trip, there was no effort required. 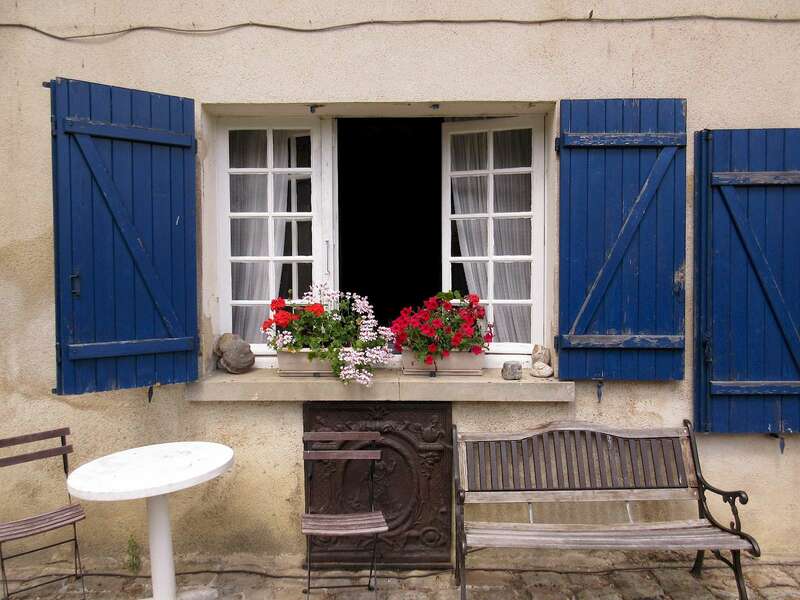 We stopped for homemade apple cake and cider at a B&B run by Madame Caroline in the little town of Gandelu, and fell in love with her home, which until a century ago housed a grain mill powered by a meandering stream that passed under it. Madame Caroline’s bed and breakfast in Gandelu. Having enjoyed our snack, we began our goodbyes, but Mme. Caroline said, “No, no, not au revoir. I’ll see you soon.” She did. She was our tour guide a half hour later in the town’s old church. AND, YES, THE RIDING WAS GREAT! 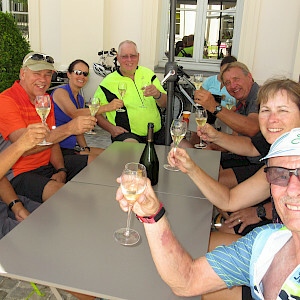 It bears repeating: the riding was spectacular – beautiful scenery, great roads, a comfortable pace, with great companions. But I admit the food was calling out to me. 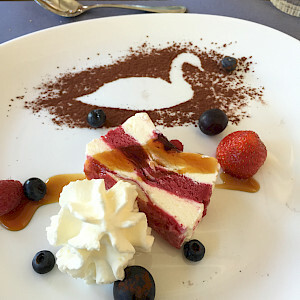 Desserts are not just an exquisite mix of tastes and textures; they’re a work of art. Good wine and good cheese – a pairing made in heaven. 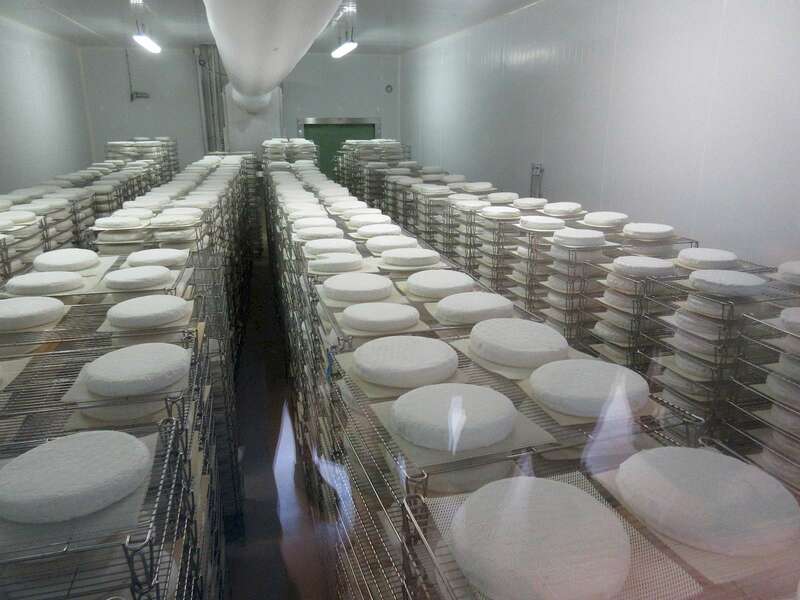 In the town of Meaux, we visited a cheese producer that makes Brie de Melun, a direct descendent of a cheese made in the area 1000 years ago. Made from raw milk from cows (and therefore not sold in the U.S.), it is famous for its smoothness and rich flavor. 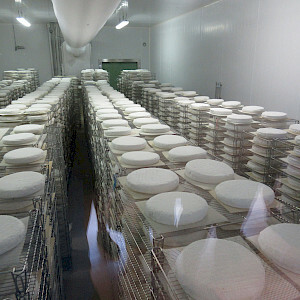 At Saint-Faron Cheese in Meaux, brie is prepared for aging. As anywhere in Europe, we also saw a national awareness of the value of preserving the past – not just for nostalgia and beauty, but for utility. We saw workman refurbishing a hand-crafted bridge built in 1875, made of mahogany, with supports as solid as if they were made yesterday. 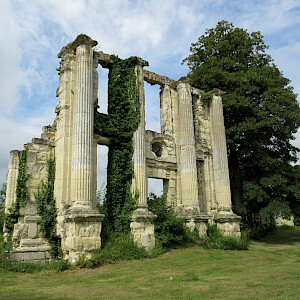 At the ruins of the grandiose Palace at Montceaux-les-Meaux, curators’ preservation of the remnants allowed us to appreciate the stunning beauty of the site where King Henry II and Catherine de' Medici played pall-mall, an early form of croquet, on the lawns. 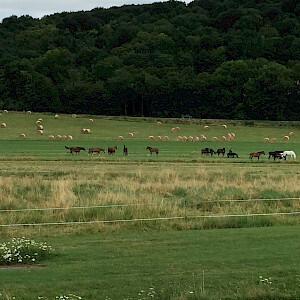 But everywhere we also saw ultra-modern facilities, enjoyed fast WiFi, and saw advanced industrial complexes that make France the world’s sixth largest economy. Every town has its church and bar – perfect for us to take a quick break. 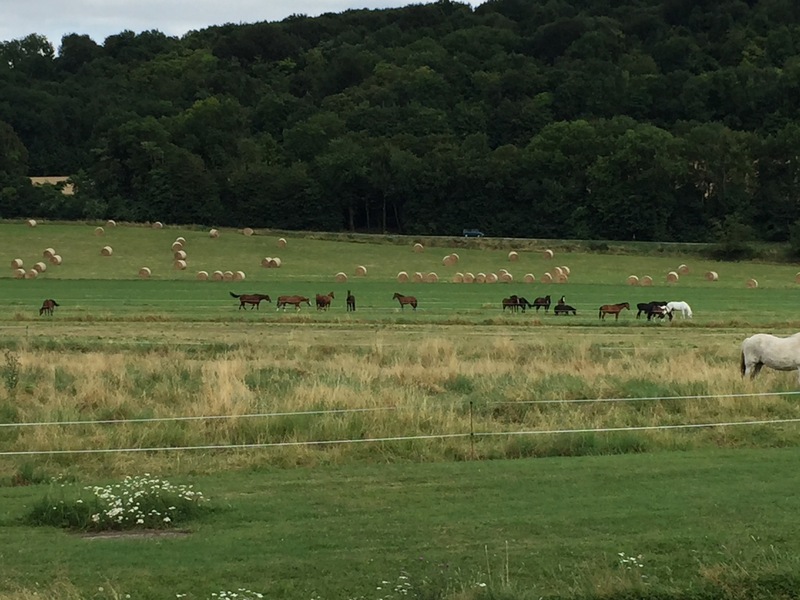 This is Lucy-le-Bocage, with a population of, perhaps, a couple hundred. 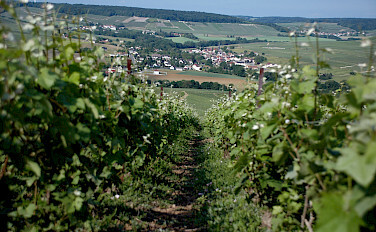 The Champagne Tour was run in both directions this summer – from near Reims, in the heart of champagne country, to Paris, and vice versa. My brother, with whom I’ve teamed up for past rides, suggested we go north-to-south because, obviously, it looked downhill on the map. 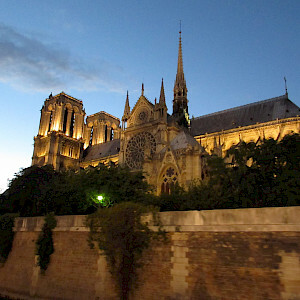 We also opted for Paris as our destination as a special capstone to six glorious days in the countryside. Notre Dame, Paris, on our river cruise. 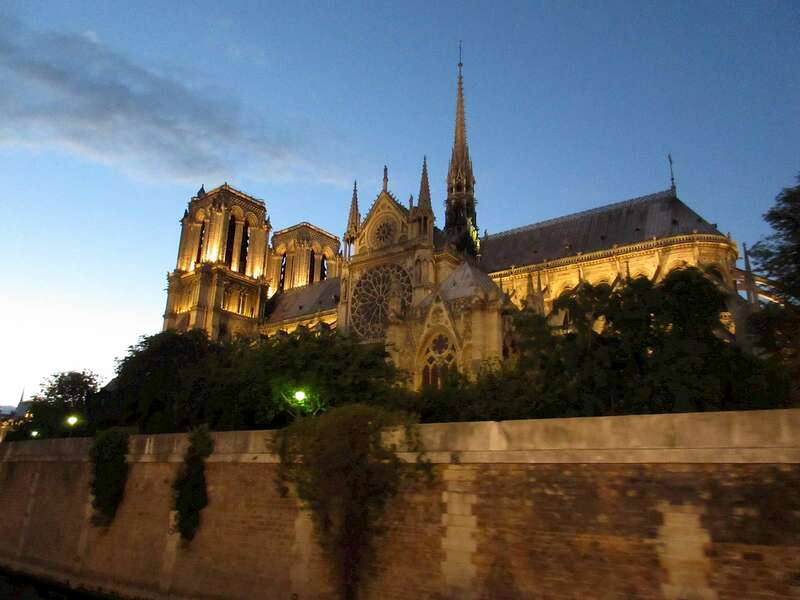 And when we arrived in Paris … the City of Lights … and Romance Capital of the world … it was as beautiful as ever. Some in our group had never been there before. They loved it as much as we previous visitors did. 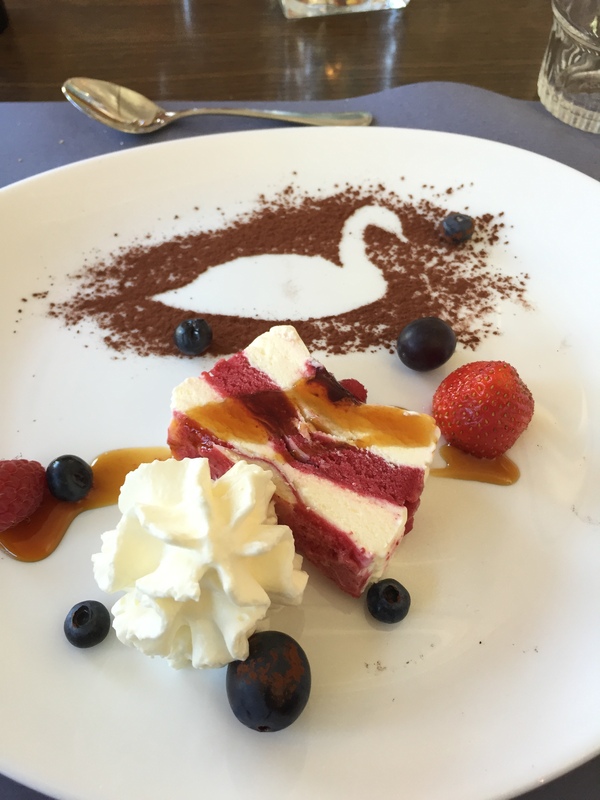 The architecture, the food, the museums … all wonderful. 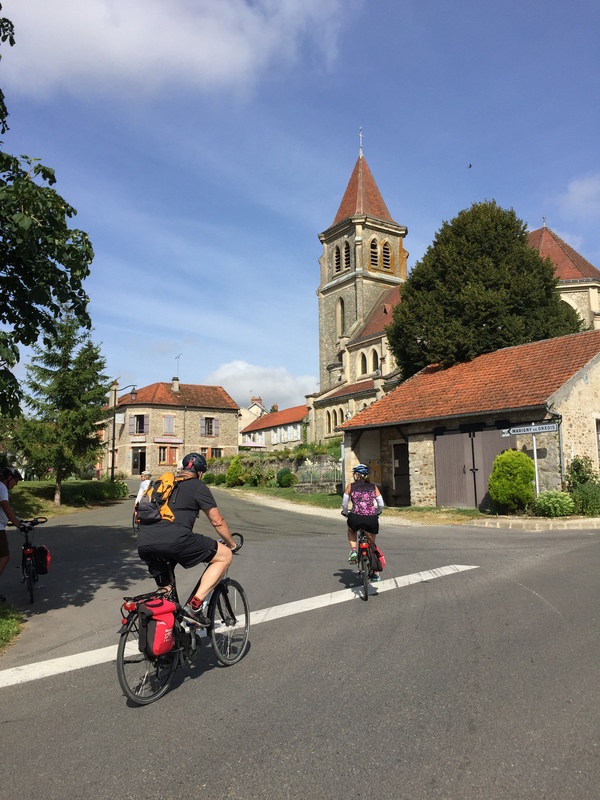 Cycling is growing roots in Paris as city-operated bike kiosks and protected lanes proliferate throughout the city, but our group was delighted to ride Le Metro – one of the world’s oldest subways – on our day of touring. Perhaps one or two of us also would have felt out of place walking through Paris’s five-star luxury department stores, like the Galeries Lafayette, in our riding shorts and jerseys. 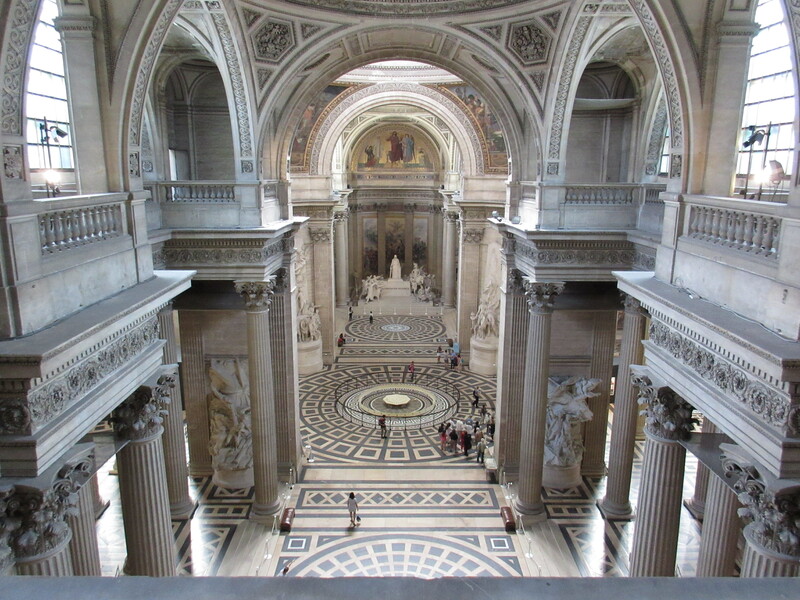 The Pantheon in Paris pays tribute to the heroes and ideals that define France. 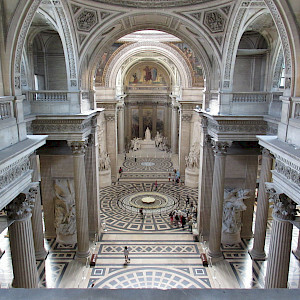 The statue at the end of this majestic hall portrays Marianne, the symbol of France, and members of the “National Convention” – the parliament during the French Revolution – on the left and the Army on the right. We capped off our tremendous visit to Paris and France with a magnificent nighttime boat tour up and down the River Seine. As we cruised from the Eiffel Tower, by the Congress, alongside the Notre Dame, and back, we all felt pride in our great ride and our friendships with each other and France. Our au revoirs were tinged with sadness, but our pride in this wonderful trip was magnifique! 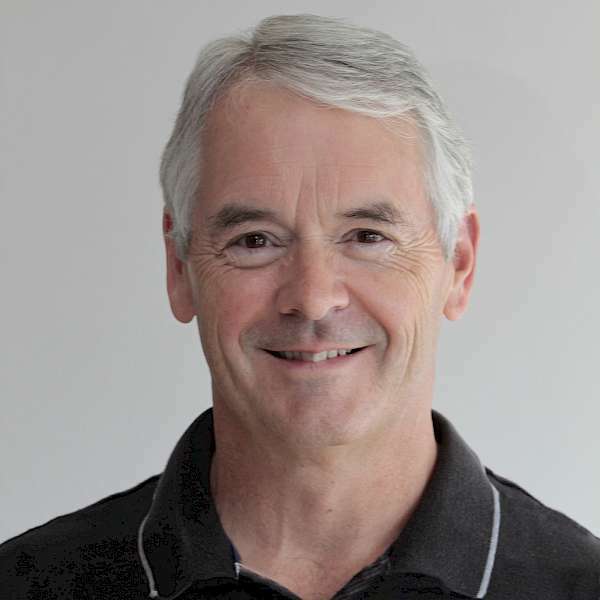 Fulton Armstrong is a semi-retired government analyst who teaches and writes at American University in Washington, DC. He has lived in five foreign countries and travels whenever he can. What a fun time! 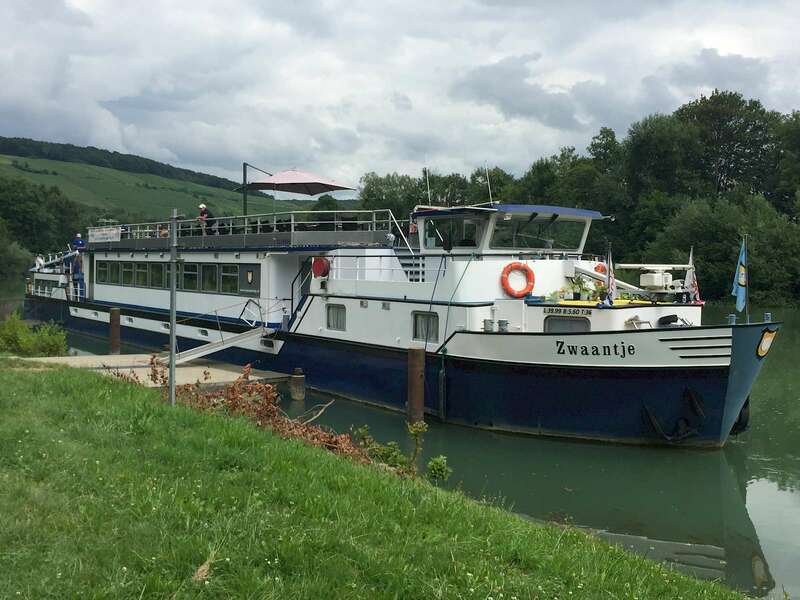 Having a beer or two on the top deck of the Zwaantje each night was a great way to finish the day. The Zwaantje bar was well stocked and very reasonably priced. 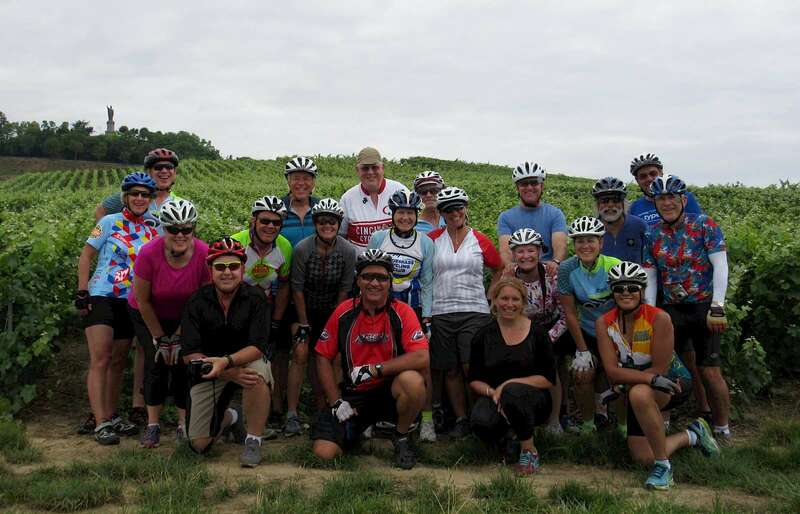 Fulton....thank you for capturing the essence of our trip of a lifetime in the Champagne countryside of France...not to mention the wonderful experiences along with sharing them with old friends and meeting new ones. Looking forward to our next adventure! !